I love this beautiful devotional by Holley Gerth! 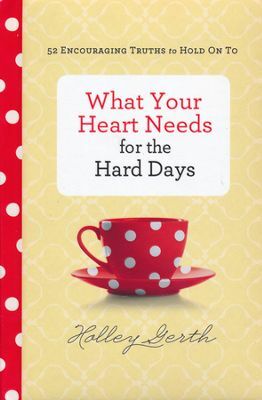 If the title doesn’t immediately appeal to you, the red polka-dotted coffee cup absolutely will! In fact, someone please tell me I can buy the cup and saucer somewhere?!! Holley Gerth does an excellent job providing 52 devotions based on the Psalms to help you get through the difficult days we all encounter. I loved so many of the devotions, but a few appealed specifically to me. Number 32, “God Will Ease Your Anxiety,” speaks to an area I struggle with frequently. Whether it’s a truly serious situation or a worry I have blown out of proportion in my mind, anxiety can rule my day. Holley begins this chapter with Psalms 94:19, “When anxiety was great within me, your consolation brought me joy.” She goes on to point out, according to this verse, not only will God calm our anxiety, he will give us joy. I love this! I would love to trade my anxious moments for joy! I think I will. I love so many of the devotions including, “God Gives You Permission to Laugh,” and “God Knows Your Calendar.” I have enjoyed reading through them. It may sound silly, but I often do “hair dryer devotions.” It takes some time to dry my big head of hair in the morning, and I often read a devotion while I am sweating underneath the heat of my dryer. This book is perfect for hair dryer devotions! Each are a few pages, super encouraging, and a great way to start your day. I was given a complimentary copy of this book by its publisher, Revell, in exchange for an honest review. I have not been compensated and all opinions are my own.